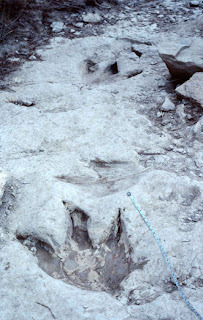 Thus, in October 1990 we agreed to meet partway between our homes at Dinosaur Valley State Park near Glen Rose, Texas. We'd gone to this park with other friends back when I was still in college. It has some of the best preserved dinosaur tracks in the world, including a chase sequence between a carnosaur and a sauropod. Many of them were excavated during the 1920s and taken to the American Natural History Museum in Washington, DC, but hundreds still remain. Most of the tracks are located in and around the limestone-ledged Paluxy River, best seen when the water levels were low, as they would be in the fall when we went. We collaborated by phone on a menu and arrived after work on Friday, grabbing a quick look at some therapod tracks before moving into the screen shelter we'd rented, which was simply a wooden roof over a small concrete pad enclosed by screen. We made dinner, talking animatedly with the ease of old friendship. There was nobody else camping in our entire leg of the park. Mary blew up her air mattress and put it in a far corner: She didn't like her sleep to be disturbed. I put my pad in the opposite corner and spread my down bag on it. It would get cold at night, and the wind was up. By 9:00, Mary was ready for bed, being the early riser type. I had forgotten to bring anything to read, but Mary had gone by the Dallas Public Library on her way out of town to pick up best-sellers she had on hold. She offered my choice of these. I looked them over. One was by Michael Crichton, whom I knew as a good writer from The Andromeda Strain and The Great Train Robbery. [Note: This was long before he lost his mind over climate change.] 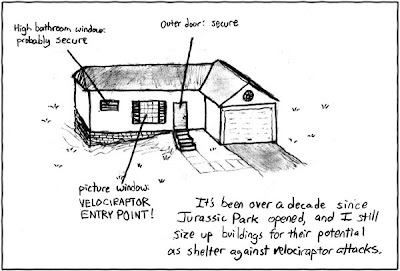 This new book was called Jurassic Park. Neither Mary nor I had heard anything about it, but there was a dinosaur on the cover, so with a laugh, I chose it. I crawled into my bag with my pocket flashlight, covered my head with the flap to keep light out of Mary's face, and began reading. At midnight, I was in paroxysms of terror and my flashlight died. Going to sleep was not an option. I was no longer able to think very clearly, if truth be told. I knew there was a good flashlight in the toolkit of my Honda: the issue was how to get to the car without being run down by velociraptors. I eventually made the sprint and got back to the screen shelter in record time, wheezing enough to need to use my inhaler. I found no way to lock the screen door, then realized it didn't matter, we were simply in Saran wrap from a giant carnivore's perspective. I huddled in my bag again and began draining the battery on a second flash. An hour later, I realized I should have taken the chance to piss while I was outside the first time. My bladder was stretched tight, from fear and cold, and I wouldn't be able to last until morning. The nearest bathrooms were five minutes away -- we'd deliberately chosen to be away from traffic areas. I scanned the dark for as long as I could bear it, looking for signs of raptors and finding plenty. Finally I bolted outside the door, dropped my pants and let go. In my mind, I'd traveled a dangerous distance from the shelter. In reality, I was two feet from the door and on a slope where the stream traveled down and pooled on the sill, which I didn't realize at the time. I finished the book right before dawn. I fell asleep from sheer exhaustion, still shivering, only to be awakened half an hour later when Mary ventured outside in her moccasins to walk to the bathroom.